Whether one loves or hates cricket, understands what turns square legs into fine legs, or how mid-offs become silly, the game is a cultural and social force impacting far beyond the playing field. The Changing Face of Cricket is an indispensable guide to cricket’s many cultural contours, uncovering its social meaning and its deeper imprint. For cricket enthusiasts there is nothing to match the meaningful contests and excitement generated by the game’s subtle shifts in play. Conversely, huge swathes of the world’s population find cricket the most obscure and bafflingly impenetrable of sports. The Changing Face of Cricket attempts to account for this paradox. 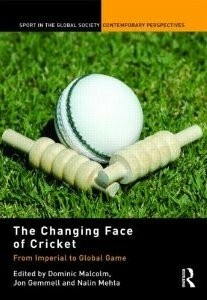 The Changing Face of Cricket provides an overview of the various ways in which social scientists have analyzed the game’s cultural impact. The book’s international analysis encompasses Australia, the Caribbean, England, India, Ireland, South Africa, Sri Lanka and Zimbabwe. Its interdisciplinary approach allies anthropology, history, literary criticism, political studies and sociology with contributions from cricket administrators and journalists. The collection addresses historical and contemporary issues such as gender equality, global sports development, the impact of cricket mega-events, and the growing influence of commercial and television interests culminating in the Twenty20 revolution. a painstaking and commendable effort to study the complex cultural impact of cricket from imperial times to the present day of globalization…a comprehensive and highly welcome multidisciplinary examination of the evolution of cricket against broader social and political context, covering an impressively expansive geography (Australia, the Caribbean, England, India, Ireland, South Africa, Sri Lanka and Zimbabwe). ..main contribution of the book to the wider field of sport studies lies in the disciplinary fluidity, the rich detail provided regarding identity and the discussion of post-colonialism in association with cricket.